proposed formation of an Integrated Transport Authority, discussed at the recent BusNSW conference at Terrigal. "BusNSW has been advocating for a customer facing organisation for a number of years following the success of MetLink in Victoria, TransLink in Queensland and TransPerth in WA," BusNSW Executive Director Darryl Mellish says. At its annual conference held in Terrigal last weekend BusNSW profiled the confusing branding and lack of marketing that exists for public transport in Sydney. "Each of the government agencies and private service providers has had their own view of promoting public transport services in the absence of a coordinated strategy and proper budget," Mellish says. The ITA concept to be implemented by the new Government will link customer experience with planning, infrastructure and service delivery, which has been lacking under the previous government’s structure. Mellish says there has been improvement in bus services over recent years with the expansion of integrated networks, new Metrobus services and free loop buses. "But the previous approach to marketing has focused on profiling the State Government itself rather than promoting the use of the new services," he says. "Recent transport plans have indicated further growth of the bus industry because of its ability to react quickly to passenger demand." Mellish says buses and coaches are key components in public transport, tourism, energy savings, environmental preservation, road safety, mobility and the economy. "No other mode of passenger transport plays as key a role in all of these aspects," he says. "These benefits need to be promoted in an overall Government Public Transport strategy." Also at the Terrigal Conference the bus industry outlined how it can contribute to the new Government’s policies relating to the economy, returning to quality services, renovating infrastructure, protecting the local environment, and restoring accountability. "The bus industry contributes to all of the ten transport policies released by the new Government, for example extending NightRide bus services and integrating with other public transport modes," says Mellish. 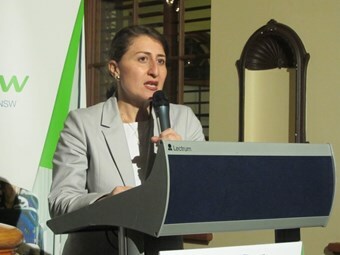 Following the announcement of an ITA, BusNSW will also seek a meeting with Berejiklian to discuss the controversial metropolitan bus services procurement model, attracting heated discussion at the close of the conference last Saturday.